The stock suspension on the VR4 is excellent for most street applications. The ECS offers a best of both worls approach with comfortable cruising yet reasonably aggressive performance in the twisties. Full out track duty is another issue and unfortuantely you can't have it both ways. ECS is lost as soon as the stock struts are replaced with aftermarket strut cartridges or shocks. 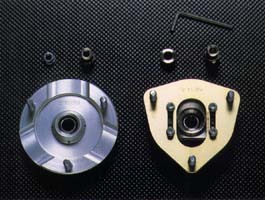 Aftermakret springs can be used without affecting the ECS. Lowering springs will affect ride height and will compromise shock travel. This often leaves little room for camber adjustment once installed. Lowering springs by themselves will lower the car's ride height at the expensive of shock travel. The result is often a harsher ride and reduced suspension travel that is prone to bottoming out. A drop of more than 1 inch is not recommended without using a height adjustable spring kit and possibly camber adjustment plates. GAB struts work extremely well and are considered the best. The rear struts have 8 dampening adjustment settings, the front have 4. This will affect the ride stiffness of the strut. The struts are extremely high quality and offer a firm but supple ride when combined with the right spring. Spring rates required for all out performance will leave the car with a very harsh ride. Most drivers of street driven vehicles will not appreciate the resulting ride quality. A compromise between performance and comfort will ultimately result. For all out performance most of the "lowering springs" on the market will be inadequate. Height adjustment is also an overlooked but critical factor. Ground Control Suspension offers a height adjustable kit for the VR4 with a wide variety of choices for spring rates which will suit any application. The big advantage is that the ride height can be lowered without reducing suspension travel. Options are available from RS*R, Eibach, Intrax and others. Most report excellent results from Eibach. Some have reported sagging and excessive ride height drop with Intrax. 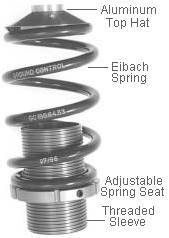 Offerings for coil over shocks typically allow ride height adjustment and fine control over dampening. Such systenms are expensive but worth it if you require the ultimate in handling performance. Offerings areavailable from Ground Control, Tein and Cusco. These allow greater flexibility in camber and in some cases caster adjustment. Sometimes the pillow ball mounts will transmit more noise to the car. Consider the use of bearings from Ground Control to reduce wear on the pillow ball mounts. Offerings are available from Cusco and Road Race Engineering for the rear only. Bozz Speed of Japan may offer front strut tower bracing. Addco sway bars are available for the NT cars but not specifically for the VR4, although the rear sway bar from the NT should fit the VR4. Excess stiffness of the sway bar is not desirable so consider this modification carefully on the VR4 model. Polyuerethane bushings are stiffer than the stock rubber counterparts. This allows the suspension components to operate more effectively. No known kit is avaialble but sway bar bushings come in a variety of sizes and it should not be difficult to find the correct size. Other bushings may be more difficult to cross-fit.